Ray has developed many home designs that are modifiable to suit your specific needs. Begin with the design of your choice, then modify and update until you reach the right home at the right price for you. Lots are available throughout the western suburbs or a home can be built on your lot. Model homes are available to tour or view current listings through our Model Homes section of the website. Raymond Drake Homes is also able to work with you to develop an entirely custom home design for your specifications. Raymond Drake Homes built 12 homes during their first year in 1980. Over thirty years later and they have built as many as 90 homes in a year. 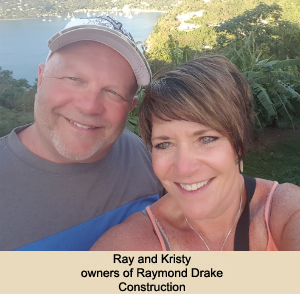 Ray and his wife, Kristy, strive to build quality homes at an affordable price. Along the way, Raymond Drake Homes has won many prestigious awards including: the coveted "Trillium Award," the Home Builders Association of the Twin Cities "Award of Excellence in Design" and the "Reggie Award of Excellence." Ray has also been nominated as a Reggie judge for numerous years. Raymond Drake Homes realizes that a change to the existing home you love may also be necessary. Raymond Drake Homes has the experience and knowledge to handle any construction project, large or small. From a deck to an addition, storm damage to a basement finish; you name it, they can do it.